Kristy and Ben were married at the Barn @ Primo in Rockland, Maine on what started as an overcast July day. 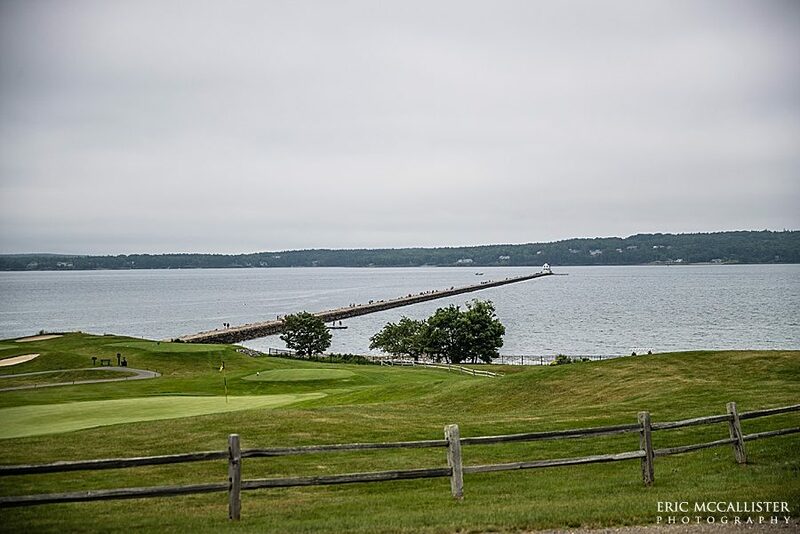 I met up with Kristy as she was getting ready for the wedding at the Samoset in Rockport. It was one of the more exciting getting ready sessions that I have ever had, but not out of choice. I literally had just said hello when the fire alarms when off. Everyone in the resort headed outside to wait. Not ideal for wedding prep. As it turned out, a sprinkler had been set off by another wedding party and was flooding the floor above us. Once the all clear was given by the fire department, we watched water sluice down the stairwell. Oops! This put Kristy into hurry-up mode to get ready and off to Primo, but she never let it show if she was stressing. Despite being in a hurry now to get to Primo, she still allowed us to pause for portraits on the way out the door. Over at Primo, the ceremony was setup for right outside the barn. It had rained off and on during the morning, and plastic was still covering the hay-bail seats. The forecast was for clearing skies, and sure enough, just in time for their ceremony, the sun came out! Ben was absolutely glowing as he waiting for Kristy. And the looks and smiles between the two of then during the entire ceremony were great. Rev. Erika Hewitt performed a lovely service — she always does! — that concluded with a kiss and even bigger smiles!